Washi tape is the best invention since sliced bread! There are so many fun things you can do with washi tape. Make anything cuter with some colorful patterned washi tape! I’ve found these projects to craft with washi tape that I think you are going to LOVE! 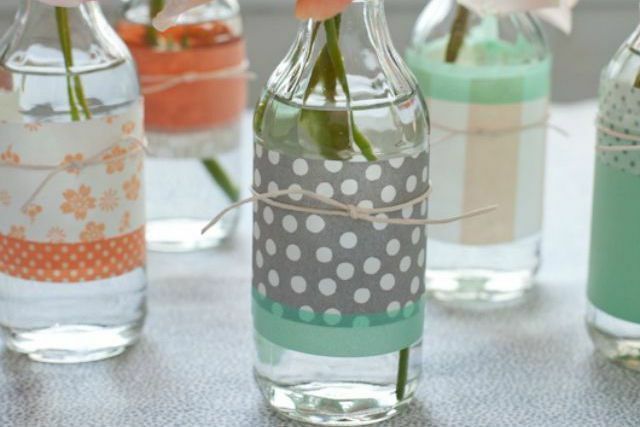 Decorate plain bottle vases with pretty washi tape. These vases are perfect for a party or beautiful home decor. Cherry blossom trees are so beautiful in the spring. Recreate that beauty with your kids with this fun and easy (and blissfully mess-free!) cherry blossom tree craft. It’s great to craft with washi tape when making these backpack tags–easy clean up and no mess! These clothespins are cute and inexpensive. It only costs $1 to make these decorative clothespins! Rest your glass of lemonade on these adorable DIY coasters decorated with washi tape. Alternate the colors and patterns of the tape you're using to make them extra cute. These pencil holders make the perfect gift for your child’s school teacher. You can make these with any kind of containers you have around your home. This is a fun and easy wall decor idea for a kid’s room or a gallery wall. Customize it with whatever colors and patterns of washi tape you like. Get your kids in on the crafting with this fun paper tube train. This train will keep them having fun for hours! Show off your creative style by decorating your phone cover with colorful shades of washi tape. This is an easy, cheap and impressive craft idea.